There are many fans of super food green drinks who will vouch for the healthy boost that these smoothies give. They have experienced weight loss and an increase in energy levels after consuming super food green drinks. With less natural and more processed foods forming parts of many diets nowadays, often due to busy lifestyles and time pressures, it is important to ensure a balanced intake of green foods is maintained to keep healthy. Barley Grass, Spirulina and Wheatgrass powders are a great way to add back that missing green nourishment! Why are the super food green drinks so good for you? These super food green drinks are packed with minerals, carbohydrates and vitamins for your healthy nutrition. Green smoothies can also help you to control weight loss effectively and safely without the need to starve. Barley Grass - Has antioxidant properties () and a glass of barley grass juice a day has many necessary nutrients to help maintain good health. It is excellent when you want to maintain a proper balance of acids and alkaline in your body. It is also useful for healing various chronic conditions ). It has a high content of phytonutrients which help build your bodies’ defences against many diseases. Spirulina - When you make a drink out of spirulina, you are taking in algae which is good for your health as it contains over sixty per cent protein and amino acids that your body needs to function. In addition, you will get a fair dose of Beta-Carotene, manganese and copper. Spirulina also has antioxidant properties along with fatty acids that are essential for you. It can help in cleansing your liver and help balance cholesterol levels in some patients, besides boosting your immune system which can aid with allergy suffering. Wheatgrass - The juice made out of wheatgrass is probably one of the best ways ofgetting chlorophyll into your body. 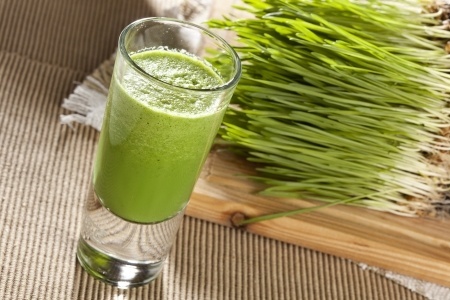 A glass of wheatgrass juice will have about seventy per cent chlorophyll content in it. Wheatgrass contains high level of both Vitamin A and C, more than oranges! The protein found in wheatgrass is in the form of polypeptides which are smaller and more biologically convertible than other protein enriched foods. The beneficial enzymes in wheatgrass have also been shown to help protect against carcinogens. Super food green drinks are a great way to start your day to get that increased energy as they give you a strong boost of minerals and vitamins along with antioxidants without straining your digestive system. With a regular and healthy diet including super food green drinks, you will start to feel great!